There are so many options to choose from when considering a scope or sight for your gun. Yes, I said scope or sight because those two aren’t exactly the same. Anything with the word sight in it is not going to have magnification. Anything with the word scope is going to have magnification. You may hear the terms red dot sight and reflex sight used interchangeably. This is because they are essentially the same thing. Red dot sights place a red dot on the target. This can be used in place of or in addition to the iron sights on your gun. You can use a red dot on both a rifle and a hand gun, so it makes a red dot sight pretty versatile as far as sighting goes. 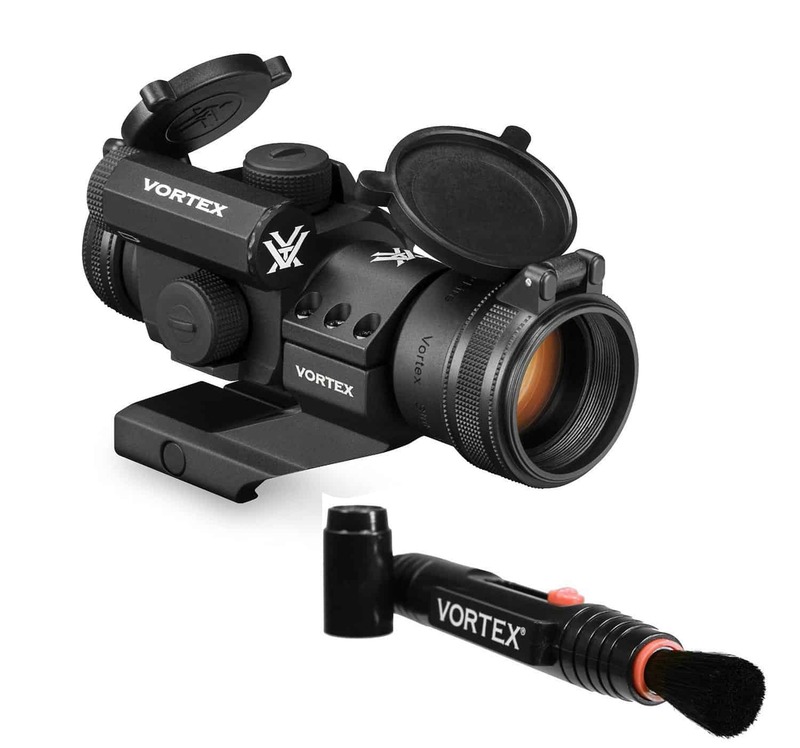 Click here to get the lowest price for the ﻿Vortex Optics StrikeFire 2 Rifle Scope﻿on Amazon! One of the reasons that a red dot sight is easier to use –especially for new gun owners-- is that it automatically corrects to the target despite the angle of the eye to the sight (to an extent). The parallax will interfere with a red dot sight if you do not line it up to your eye, but it does not have to be a perfect alignment like it would need to be on a scope. It is also far easier to sight a red dot than iron sights or the three dot crosshairs on most pistols. The construction of a red dot sight is fairly sturdy. Typically all of the glass is housed inside a cylindrical metal casing. This makes them quite durable and protects the glass from any damage due to limbs or other debris when trecking through the woods. A holographic sight is similar to a red dot sight, but a slightly better version. Holographic sights have a smaller build than a red dot sight. They are typically a metal square frame with the glass sitting in it. This allows for quicker and easier target acquisition. In addition to the difference in the construction, holographic sights have smaller levels of parallax interference. Meaning that the angle you hold your gun at is going to be less affected by distortion. You will not have to perfectly line up your gun to your sight to hit on target. 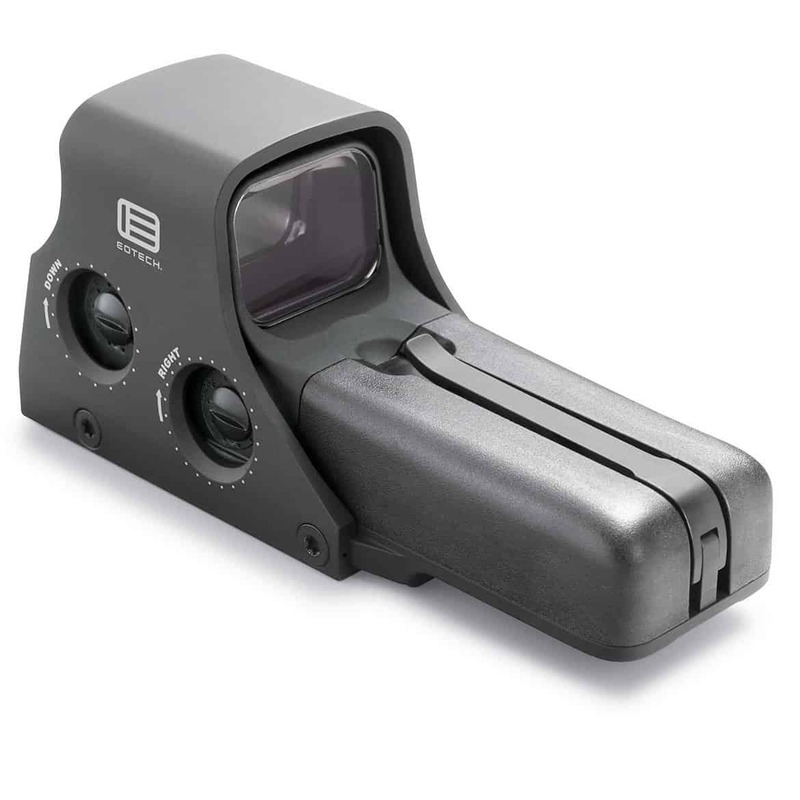 Click here to get the lowest price for the ﻿EOTech 512 Holographic Sight﻿﻿ on Amazon! Also, holographic sights will typically have a different reticle than red dot sights. The holographic sights can be customized, but they will feature a small pinpoint inside of a larger illuminated red circle. This allows for greater target accuracy because less of the target is obscured by the red dot like on a red dot sight. A scope has magnification on it. The magnification is the primary difference between a scope and a holographic sight and a red dot sight. Some scopes do utilize red dot reticles, while most will have a MIL or MOA reticle to assist with windage and elevation. 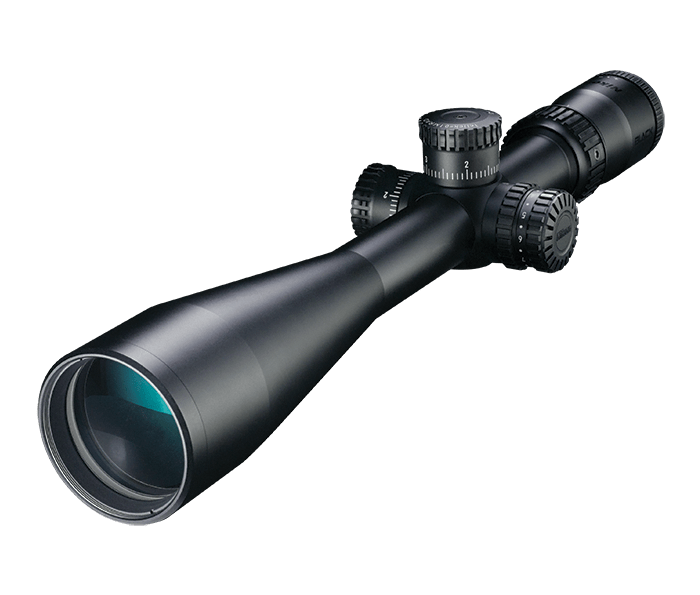 Scopes for rifles have varying magnifications depending on the distance that you plan on shooting. Typically when discussing scopes, you can have a first frontal plane scope or a second frontal plane scope. The first frontal plane scopes have reticles that grow and shrink with the magnification of the target. The reticle at 10x will be much larger than at true one. This assists hunters and long range target shooters to stay on target because there is no need to compensate for windage and elevation calculations on your MIL. First frontal plane scopes are more expensive than second frontal plane scopes. Click here to get the lowest price for the ﻿ Nikon BLACK X1000 6-24x50 ﻿﻿ on Amazon! When dealing with second frontal plane scopes, you do not get the same scaling of the reticle. This means that a reticle at 10x is going to be the same size as the reticle at true one. This can cause some problems when doing windage and elevation calculations if you do not remember to adjust for the magnification. Though, once practiced with a second frontal plane scope most shooters do not have a problem making those adjustments. An advanced combat optical gunsight (ACOG) is essentially the bridge between a traditional scope and a red dot sight. The ACOG itself is made by Trijicon, but there are other manufacturers who make similar technology gunsights. These offer up close targeting with red dot sighting. Click here to get the lowest price for the Trijicon ACOG 4x32 on Amazon! The only problem with an ACOG is that it is not made for close quarters firing. If you are looking to hit close range targets, you either need to stick with a holographic/red dot sight or get an ACOG with a holo sight mounted on top. When is which better to use? Depending on your experience level, you may find you have a different preference for sights. The holographic sight is superior to the red dot sight simply because it does a lot more compensation for your eyes than a red dot sight does. You can hold the gun at varying angles and still get your MOA on target. Also, the holographic sights have fewer parallax issues which make them superior to their red dot counterparts. If you are looking for anything with magnification though, the holographic sights and red dot sights are not going to cut it for you. Trying an ACOG or traditional scope may leave you more satisfied at the end of your day; especially if you like to get up close and personal with your targets. Each of the sights and scopes will have their own unique quirks. Getting to use a few different optical options before you invest is going to be your best bet for guaranteed satisfaction.